So, before the sun was up, I padded into the kitchen and made myself a cup of tea…yes, tea…since getting sick, coffee hasn’t agreed with my stomach. When it was ready, I grabbed my tea and iPad and headed outside to the patio to do a little reading (had to catch up on what BJ and Ms. Bytes have been up to) and await the sunrise. There was a little chill in the air but it felt really good. I pulled up a chair, made myself comfy, started on my reading and waited for the show to begin. As the sun broke above one set of mountains it cast a beautiful orange glow on the other set. 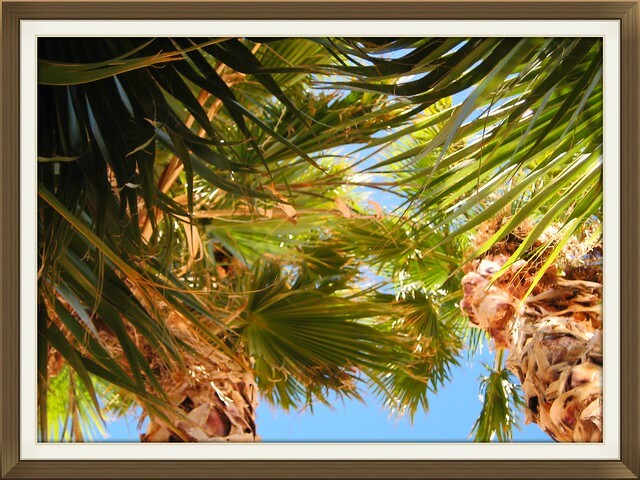 The palm trees swayed slightly in the soft breeze as the fronds became a fluorescent green in the mornings’ glory. The birds began their sweet, morning songs and it was so healing, almost stabilizing and it was…peaceful. As I sat there taking in all God’s beauty and feeling renewed, I felt a barely noticible tap on the top of my head. I looked down and a little, brown clump, about the size of a pea, rolled onto my lap. I looked up at the tree and saw the underside of a bird. Yep…a bird…took a crap…on my head. I wish I could say I handled it with the utmost spiritual maturity and said “Father, thank you because if there were no crap, there would be no lovely song serenading me this morning”. However, I didn’t. Instead I said, “God, if you feed the birds, which in turn creates crap and you know the number of hairs on my head, then couldn’t you have caused the bird to land just one small frond to the right?” Then I got up and took a shower. Sometimes it’s the little things that send us over the edge. Like when you have a cold, feel a sneeze about to erupt, reach for a Kleenex and the box spits out a handful of them like a slot machine in Vegas spits out winnings. Or worse yet, when you reach for it only to discover all the tissues have sunk into the abyss of the cardboard well they’re packaged in and you can’t get to it in time. (ACHOO!) Or…when a bird craps on your head. Remember…It’s not the fact that crap happens because…well…Crap will happen. It’s our response that counts.